Thomas H. O'Connor, "Cotton Whigs in Kansas," p. 34. Mary Einsel, "Some Notes on the Comanche Cattle Pool," p. 59. Glenn H. Miller, Jr., "Business and Agricultural Conditions in Kansas, 1871-1888: As Reported by a New England Mortgage Broker," p. 67. Bypaths of Kansas History, p. 103. Kansas History as Published in the Press, p. 104. Kansas Historical Notes, p. 109. A portion of Front street, Dodge City, in the 1880s. 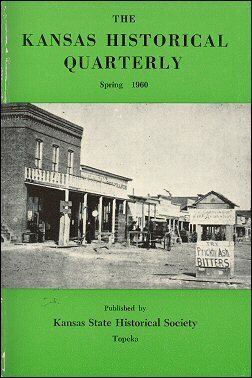 "Kansas has but one Dodge City," wrote a Kinsley editor in the summer of 1878, describing it as "The Beautiful, Bibulous Babylon of the Frontier." Part of the sign of the famed Long Branch saloon shows at the right of the second-floor porch railing.